We reported the NBC/WSJ poll results last night (the split was 43/42), and CBS News' fresh survey measures a breakdown of 47/46. In the former poll, roughly half of respondents said the Senate should vote on, but not necessarily confirm, Obama's pick. The other half said the process should unfold after a new president is inaugurated. In the latter poll, the question was framed to ask who should appoint the new justice. As Ed Morrissey concludes, "blocking the appointment is clearly not an extreme position at all. Republicans in the Senate should look at these results carefully and take heed." Yessir. Clinton has also strongly defended the administration's nuclear deal with Iran, bragging that she laid the groundwork for the agreement during her tenure at the State Department. That accord confers legitimacy upon the anti-American regime's nuclear program, abandons several crucial US pre-negotiation "red lines," features an insufficient inspections regime, and by Obama's own admission, virtually guarantees that Iran will be a threshold nuclear-armed state when the deal's restrictions automatically expire over the the next decade-and-a-half. Tehran has kept on provoking and violating international obligations after the deal was implemented (but never formally signed), engaging in continued suspicious behavior and flagrant violations. Their material support for terrorism is undiminished. A newly-released Gallup survey shows that the public has not warmed -- at all -- to this Obama/Clinton "accomplishment:"
The agreement is underwater by 27 points, almost exactly the same margin Quinnipiac measured last September. 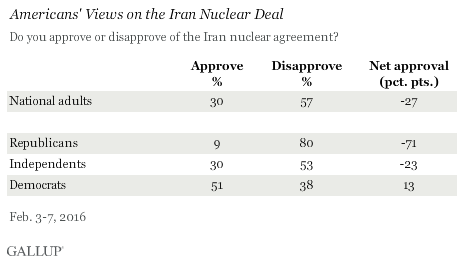 Gallup's findings show that Republicans overwhelmingly reject the agreement, with independents breaking solidly against it, too. Only Democrats support the plan, by a relatively narrow 13-point spread.